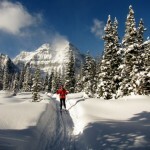 Being in Calgary, we looked for a local version of our annual Vancouver/Coast Mountains nordic ski trip to the Journeyman backcountry lodge. 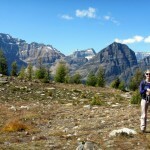 We discovered Shadow Lake Lodge and easily persuaded our friends Garth & Mandy and Al & Elspeth to join us from Vancouver. This was our end of season Fall hike. Egypt Lake is worth a weekend trip (although we never went to the mediocre lake itself). There are other more spectacular hikes, but this is so accessible you can start late in the day and still have a good weekend in the mountains. Whistling Pass above Egypt Lake is well worth a visit once you have pitched your tent. 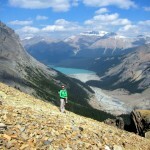 The Peyto Glacier and Cauldron Lake hike is fantastic. It’s another unmaintained and unoffical hike, but it is straightforward to the glacier. You really feel that you have gotten off the beaten path and entered aother world – one caused by the glacial morraines and washout river flats of the massive Peyto Glacier.